Viking Line commenced service in 1959, when the S/S Viking began sailing between the Finnish mainland, the Åland Islands and Sweden. 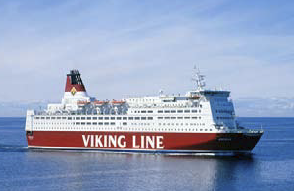 Today Viking Line has seven vessels, which sail between the Finnish mainland, Åland and Sweden as well as between Finland and the Baltic states. With Viking Line a Baltic cruise from one city to another takes less than a day. Viking Line has a wide entertainment offer: casinos, restaurants, discos and live artists. Operations include passenger services, recreation and cargo carrier services. 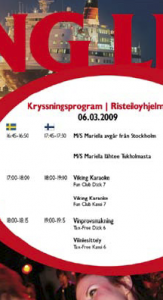 Viking Line started to look into Digital Signage for two main reasons. The environmental aspect was a big issue because Viking Line printed about 2000 sheets of paper every day for the cruise program. Screens that could show this information would reduce their printing costs dramatically. Tax-free promotions were the second focus area. 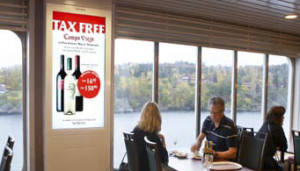 Viking Line wanted to use digital- and dynamic posters to increase tax-free sales. A digital network would also raise the professional profile and brand image of the ferries. Viking Line was looking for a supplier with experience. It wanted an established software solution that had been thoroughly tested and developed over time. Another factor was the software’s capabilities. Viking Line needed a system that could grow with them and handle new areas of usage in the future. Scala was first chosen to do a pilot in one of its ferries, Mariella. When Viking Line saw that Scala could meet all of their requirements, Scala was chosen for all their seven ferries. At this time, Mariella is up and running with 15 screens and six channels. By Summer 2009 all the ferries will have digital signage networks installed. Their installation is both an ad-based network and an information network. The ad-based network shows tax-free promotions in the most trafficked areas of the boat, near the shops, restaurant and casinos. The information network shows information on large touch screens. This includes opening hours, restaurant menus, weather, news, entertainment programming, conference information and possible delays. “Viking Line is impressed with the potential in the software, and so far we have not discovered any limitations. We are very satisfied with the user interface, and I also want to emphasize the latest Photoshop plug-in that has been added to convert Photoshop-layered elements to Scala script,” says Kenneth Kronström of Viking Line. Viking Line has already achieved what it hoped for with this installation. It has reduced its printing costs dramatically, and the company now appears much more environmentally friendly. 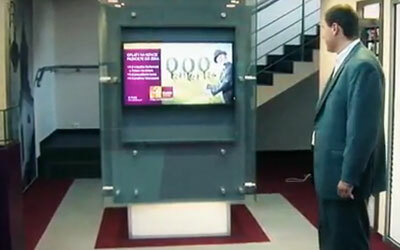 “Sales of promotion products have increased remarkably since the screens were installed. We clearly see that the customers perceive the message, and they more frequently purchase the promoted products,” says René Engman of Viking Line. Viking Line has already started to think about new digital signage projects. Their next plan is installing screens at the terminals. 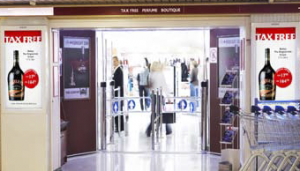 This is an area where people are typically waiting and are definitively receptive to information such as the cruise program and promotional products. Viking Line also wants to develop a new script which could show passengers exactly where the boat is at sea. A screen with a sea map and coordinates showing the boat’s position would be continuously updated along the trip.